Our prior Stores4Stores page tour demonstrated how brand identity could be maintained while using Climb Technology’s SaaS application even while personalizing, and localizing the online shopping experience. This allowed a visitor to view more than a simple page of a retail store, its hours, and location. The visitor began to see what was unique about the store that they planned to visit. In this post, we will preview more of that uniqueness a visitor will experience when they view the individual store page. Keep in mind that the fully featured Stores4Stores local retail website is visible at the bottom of this page. This post will focus on the middle third of the Stores4Stores application. What is an in-store expert? These are your employees who possess excellent product knowledge and an understanding of how customers can make best use of the products and services sold in their store. They are dedicated, trusted staff members who make that personal connection with the customer, and are the everyday brand ambassadors for your operation. 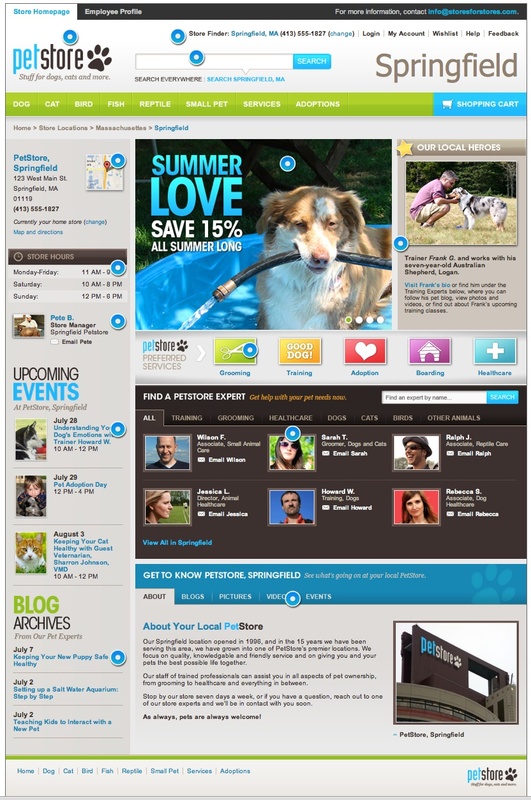 To the right of the central slideshow, the in-store experts begin to make their appearance on the page. In-store experts are knowledgeable and trusted members of your staff. After all, it is people who ultimately make the connection with shoppers and have the expertise which make those shoppers repeat customers and promoters of your brand. In order to personalize what is now becoming a local retail experience, these in-store experts are profiled with a picture, a biography, and a simple e-mail address. Of course it’s up to the corporate office or retail store manager to determine which in-store expert has the ability to post in the Stores4Stores local retail website tool, or whether to use use Climb Technology’s threaded correspondence communication solution, Communicate&Convert. Pre-approved badges lie just below the central slideshow. These managerially approved images focus a visitor’s attention on specific in-store services which are most important to the local audience as defined by the store manager, or in concert with corporate promotions. 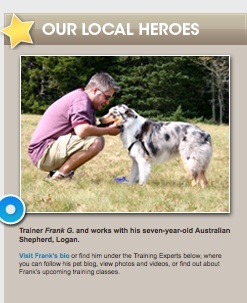 Other in-store experts are highlighted below in the “six-pack” of featured in-store employees. Visitors can click to read about the individual, get to know their interests understand their relevant knowledge. Visitors can click through different areas specific to their needs to find and communicate with the in-store expert who has the right information for them. A visitor can also find out when the employee will be in the store, and the employee’s contact information. Now when a prospect or a customer goes into the retail store, they are not just going to complete a transaction, but to further a relationship and build a a sense of trust through the recognized expertise of the person in the store. To see how staff can get in on the process of making changes to local website for their particular retail store, check out our next blog, or contact Climb Technology for a complete demonstration. To view the first post in the Store4Stores Page tour, click here.